I have always loved spotting a barn quilt when out on a road trip. Celeste and I spotted lots of them when we were out and about on our summer trip. In the Columbus/Caledonia Mississippi area Rita Williams has been a prolific barn quilter. This is a picture the Keri Lewis took and posted on FB. 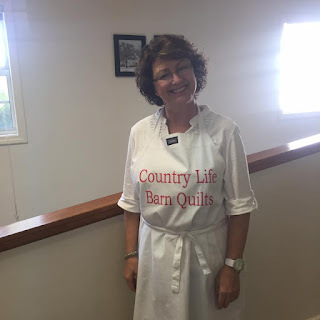 Last Saturday Rita shared her techniques with a group of us, teaching us to barn quilt. We had such a nice time. Rita's church was generous and let us paint in their fellowship hall. Several times during the day, I thought how the sounds of happy voices and ladies working and visiting was so nice. I had a wonderful day. Here are some photos of some of the barn quilts we painted. I know there were some I missed getting photos of. But it was a really fun day. Last Friday I got a chance to go to a Barbara Cline workshop. 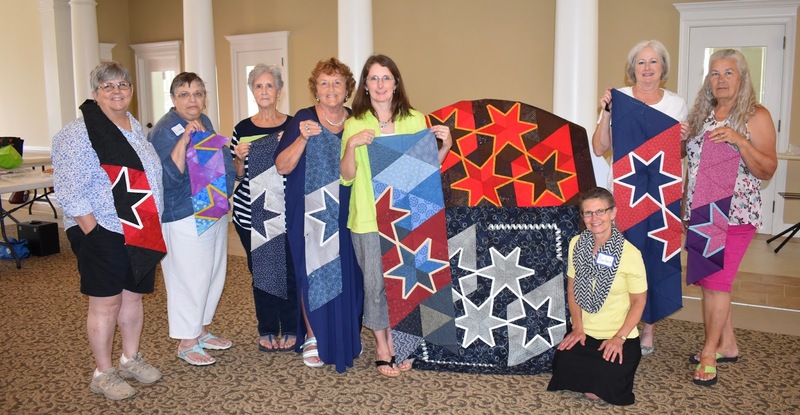 Each summer Mississippi Quilt Association sponsors a nationally know quilt teacher to come to Mississippi and present a workshop. They normally pick three locations across the state and run two workshops at each location. This year they did one workshop at 6 locations. I called my friend Lou Caffey and asked if she would like to go to the workshop with me. I suggested that we could put Starkville as our first choice and Oxford as our second choice. We ended up being moved from the Starkville class to the Oxford class. Oxford is about 10 minutes farther drive, but it was a smaller group, which is really nice for a workshop. 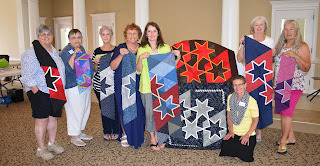 Barbara developed a special pattern for MQA workshop so we, in Mississippi, were the first to take it. 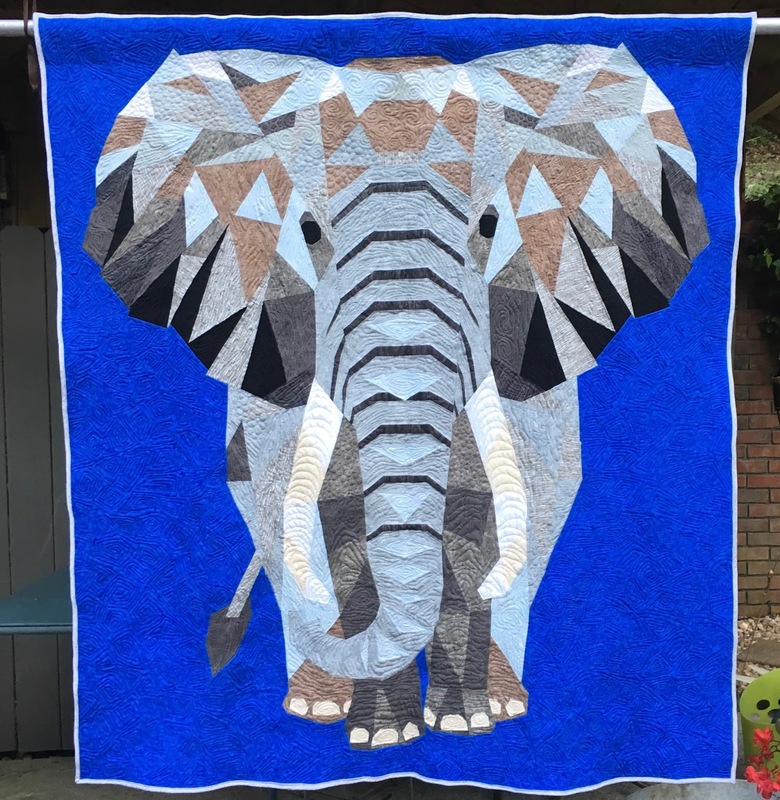 She called it cookie cutter quilt. She has developed a way to put additional interest in 60 degree triangle quilts. More on this technique in her Triangle Stars book. 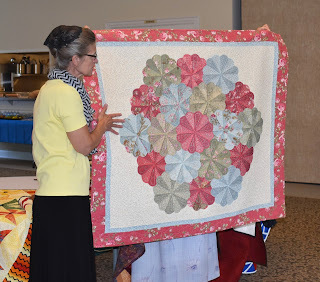 I did not take enough pictures when she was teaching, but at lunch, she gave a trunk show of her quilts and I took lots of pictures of some quilts from each of her books, but will only post a sampling here. She had written 5 books, 4 that are already published You can purchase them on Amazon or at her website...click here. My pictures are good, but if you want to see really good pictures here is a link to her blog. Here we are with what we got finished in the workshop. Lou had stepped out and missed the photo, but we had a nice time. The summer is about over. It has been wonderful...I do love my job, but I have so enjoyed this season!! It will be hard to leave it behind. The next morning when we got up and started planning our day, we had realized the night before, that our airbnb was 45 minutes past Moab. If we were to go to Moab as planned, we would have to drive back 45 minutes do our hike then drive 6 hours and 45 minutes to Denver...As we were loading up, we decided that was just too much. So we headed to Denver, the oil change light had come on in the car, so we wanted to get back in time to get that done, get groceries and moved back in before it was too late. So we pointed the car to Denver and off we went. 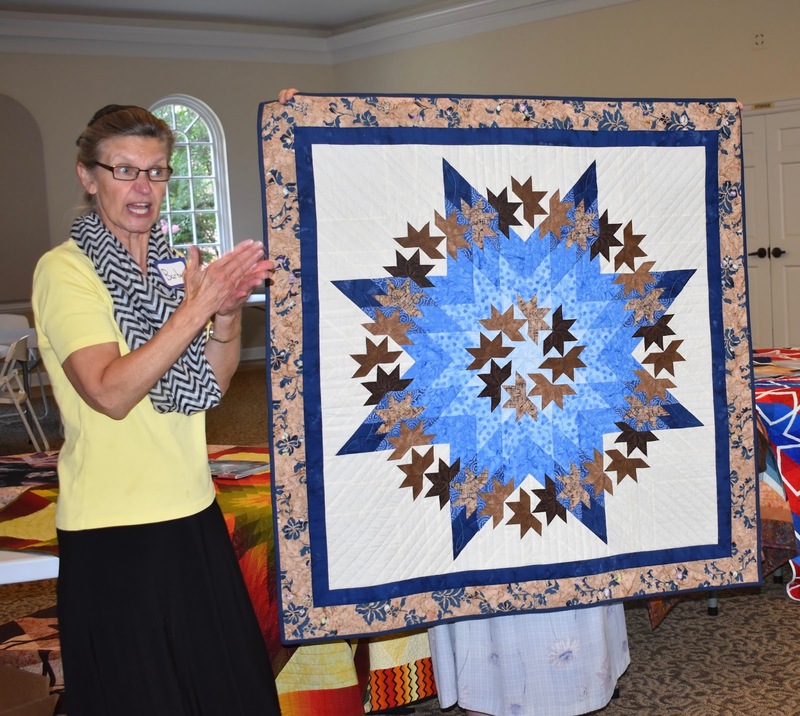 On the way back, Celeste told Blake, her beau, she wanted to make him a quilt. So they texted back and forth and decided on some samples that he liked. Celeste and I went shopping after our walk the next morning. We walked around a small lake in the Denver area, about 2.5 miles. Celeste found a pattern in the store that she liked that was similar to a quilt Blake said he liked. The pattern was Sweet Jane's Borderline Crazy. So she picked the fabrics needed for the quilt for Blake. I got a few fabrics I thought might be good for a quilt I was working on for a friend from schools first Grandbaby. 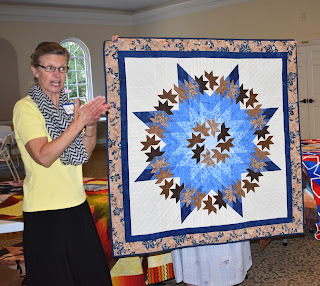 That night, after washing the fabrics, Celeste cut out the pieced needed for the quilt. Unfortunately I misread the pattern and we started putting together the blocks in the pattern of a baby quilt, and not a lap sized quilt. In my defense they had the instructions to the lap size next to the layout for the baby quilt size and no picture of the lap sized layout. So then we had to figure out how to enlarge the pattern. So Celeste came up with a plan and we added the extra blocks to each row. Luckily we had not sewn the rows together when we figured out there was a mistake. 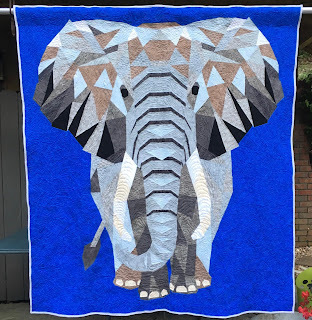 Took this quilt to Betty Lewis for quilting...it is small enough that I could have done it, but I had several other projects that had impending deadlines....(baby birth!!). It should be back this week some time. Get ready, I went way over my 10-15 picture limit on this post. We woke up fairly early in Page and headed out because there are certain hours that the light is much better in Antelope Canyon than other hours. Plus we did not have reservations and we wanted to get there early enough to get on a tour. The only way to see Antelope Canyon is on a tour. The canyon land in on the Navajo Indian Reservation land and so you have to pay a fee to enter the land, and they will not allow you to go through the canyons without a Navajo guide. The first guide that we talked to was fully booked. So we found another guide and signed up for a 10 am tour....that is pretty close to the magic hour for the lighting in the canyons. Since we had an hour of so, we went to the store and got some fruit, wrote some postcards, and got some ice for our cooler. We headed back to the staging area for the tours and waited for our guide. It got to be time to go and no joy. So we went in and asked and we had been waiting in the wrong area. So we were assigned a new guide and headed off. Because of our mix up it ended up just being the guide and Celeste and me on the tour. It made it nice because it was lots easier to get photos without a lot of people to shoot around. Our guide was a young woman who is in college to be a nurse. She was outstanding, helped us get good setting on our cameras to get the best effect. After leaving Antelope Canyon we headed to our next stop Moab.